A diode is a semiconductor device which conducts only in one direction. This effect is used for rectification when the positive part of an AC-signal can pass while a negative part is blocked. A diode has two different terminals. The positive electrode is called anode and a negative cathode. The cathode is always clearly marked on the body of the diode as a ring. The function of all this diodes is the same. The differences are the maximum operating voltages and the maximum currents. 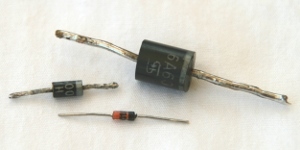 On electronic boards and in circuit diagrams diodes are often marked with a D.
Different sizes means different operating voltages and/or different currents. 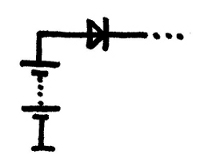 The symbol expresses the one way function of the diode. The arrow in the diagram shows the direction of the current flow. 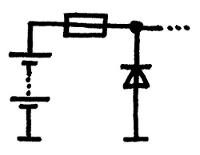 Current can only flow in one direction: From Anode to Cathode - in the direction of the arrow. As all electronic devices also diodes have losses while working. But compare to resistors the voltage drop across the diode does not depends on the resistance and the current. The voltage drop over a diode is fixed. It is always 0.7 V, no matter which current flows. (Some people say it is 0.6V). The voltage drop across a diode always is 0.7 V.
In electronics the one-way character is very often used. DC voltages can be blocked or added and AC voltages are rectified. But also the fact that the voltage drop is always the same and stable can be used as a reference voltage in stabilizer circuits and in measurement stages. When the current only goes in one direction (from anode to cathode) and the voltage drop across the diode is always 0.7V (or 0.6V), then the voltage at the anode has to be about 0.6V higher than at the cathode. We say the diode is in forward bias. The voltage at anode is more positive than at the cathode. The voltage drop is 0.6V. When the voltage at anode is smaller than at cathode the diode blocks. No current flows through the diode. The voltage at cathode comes from another source but not through the diode. The diode is in reverse bias. The voltage at anode is more negative than at the cathode. A current can not flow through the diode. The voltage at cathode comes from another source. Diode in forward direction. The bulb glows. The voltage across the bulb is 11.3V because the voltage drop across the diode is 0.7V. Diode in reverse direction. No current flows. The bulb does not glow. The bulb glows when a voltage from the battery or from the external power supply is available. When both are applied the current flows from the power supply because the voltage is slightly higher (12V), than from the battery (12V - 0.7V = 11.3V). The diode also prevents the battery by destroying from the external voltage. In this case the diode works in reverse direction. The sine wave of the AC input signal is cut. Only the positive part passes through the diode. The current only flows when the polarity of the battery is correct. Disadvantage: 0.7V voltage loss, the maximum current has to be respected. An other reverse polarity protection. When polarity is correct the diode has no influence. Is the polarity in reverse, a short circuit current flows and blows the fuse. Advantage: No voltage loss, operating current must no be respected. Disadvantage: Fuse will be destroyed and has to be exchanged in case of wrong polarity. A diode does not have a certain ohmic resistance, because the voltage drop is fixed and independent from the current. 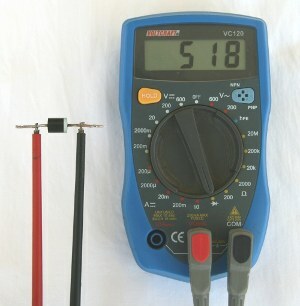 The measurement result of the ohmmeter depends more on the ohmmeter itself than on the diode. Do not use the ohmmeter range of your multimeter. Use always the special diode-range. How ever, the value in the display is not important. 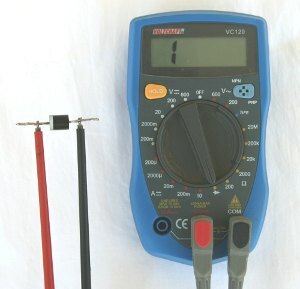 The multimeter is only used to test if the diode has conduction or not. Current flows. The display shows a value. Now current must not flow. The display shows open circuit. 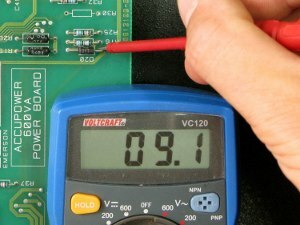 As always when working with an ohmmeter on a board, a correct measurement result you only get after disconnection of at least one diode lead from the rest of the circuit. 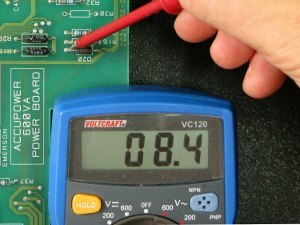 Under power the diode can be checked by measuring the voltage drop. The voltage at anode has to be 0.7V higher than at cathode. 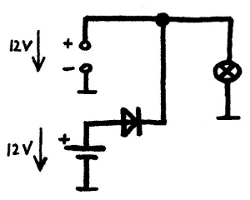 Is the voltage the same the diode has a short. Thus the voltage at cathode is 0.7V lower than at anode. In practice defective diodes always have a short. In theory it is possible that a diode first gets a short and then it bursts because of the much higher current and becomes high-resistance. But in practice a fuse is triggered or a resistor is burned before that happens. Under power a diode not only creates a voltage drop of 0.7V but also can separate two different voltages. A voltage at cathode must not necessarily be the voltage coming from the anode. It also may come from another voltage source. In general, is the voltage at the cathode higher than at anode, the voltage comes from anywhere else and the diode keeps the voltages separate. The diode is OK.
As always in electronics heat is a big problem. Diodes get overheated and/or create cold soldering points. Check all solder points of the board carefully and resolder the joints in case of a doubt. When a diode is defective choose a bigger type if possible. Diodes differ in their maximum operating voltage and their maximum allowed current. Types reaches from a few mA (1N914) to several Amps (BY550). Diodes are very cheap and standard types should not be missing in every workshop.